This course deals with the system under which the United States Government taxes the income of its citizens. The course will focus mostly on individual taxpayers but will also look at various other types of taxpayers, such as trusts, estates, partnerships, corporations, etc. It will also survey the various types of income tax imposed, such as ordinary income, interest, corporate dividends and capital gains. We will look at many types of applicable personal and business deductions and discuss the best manner in which to plan certain types of businesses, ventures and estate planning techniques. In addition, we will focus on the practical aspects of income tax law and learn how to prepare various types of federal income tax returns. Describe the types of income that are subject to federal income taxation and the types that are exempt. Analyze when, and to what extent, unearned income such as prizes, gifts, windfalls, etc., will be subject to income taxation. Recognize the types of tax deferrals that might be available and advantageous to a particular client and discuss the pros and cons of many forms of tax deferral. Differentiate between the cash method and accrual method in accounting and discuss the tax ramifications of this distinction. Explain the differences between various types of retirement accounts and the tax features of each. 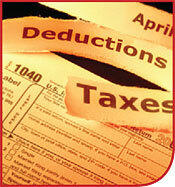 Describe the various types of personal income tax deductions that exist for individuals. Describe the various types of business income tax deductions that exist for businesses and individuals who are running or operating businesses. Analyze whether, and to what extent, a mixed personal and business expense may be eligible for an income tax deduction. Describe the income tax rates for trusts and the various options for reducing the trust’s income tax burden. Discuss the differences between grantor and non-grantor trusts and why such differences are important. Describe the method of determining long and short term capital gains tax liability. Assist in the preparation of a Form 1040 - Individual Income Tax Return, for an individual (in all but very complicated cases). Assist in the preparation of other important tax forms such as Form 1041 (Fiduciary Income Tax Return) and various extension and other administrative tax forms.